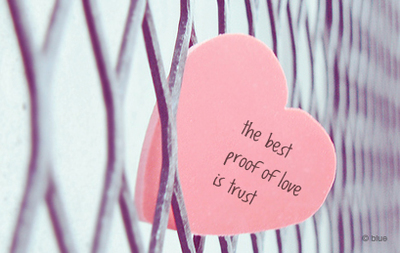 Trust is one of the most important aspects of a relationship. Without this, a relationship will struggle resulting in an unhealthy relationship. Without trust there is no proper function - living with uncertainty is not organic. Trust issues may be a result of previous experiences one has faced in their life such as being betrayed in a social sphere with friends or from a partner who has cheated or lied to you. In saying this, we cannot hold onto our past experiences and bring them into new relationships. This will bring great uncertainty into a relationship when, in fact, there should be none. If you have feelings of distrust, think about the reasons behind these feelings. Has your partner done something to bring about these feelings, or is it due to your past? Understanding the difference between the two is important. If your partner has done nothing wrong, there is no reason to be suspicious and have feelings of distrust. When you are in a relationship, you should both be able to go out with other friends and do other activities that do not include your partner. There should never be feelings of uncertainty and feeling that they may do something untrustworthy when your partner is not with you. A relationship should not feel like we are in jail. If there is no freedom due to distrust, uncertainty and unhappiness will always arise. Knowing your partner's friends and workmates will also help overcome these issues. When they go out, it will give you a piece of mind knowing that they are with people you have met, and, in most instances get along with. Always be open with your partner, as they will in return do the same. Distrust creates negative energy, so instead focus your energy on the positives. Regardless of any past issues there may have been, give people your love and a chance to show who they are. This will in turn create a happy you and a happy relationship. Trust will make or break a relationship, if there is no trust the relationship will not function. Do not become a victim or a culprit of it.